Adding texture and dimension to you space can instantly transform the look from drab to upbeat and well put together. 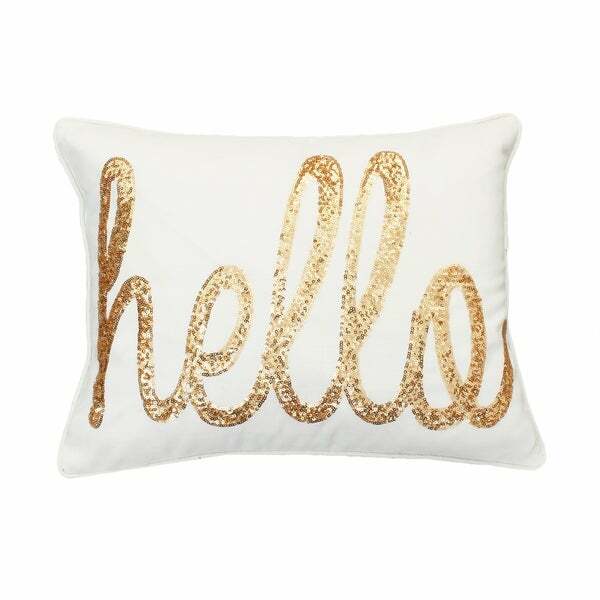 Layer your sofa, bed or entrway bench with the "Hello" Sequin Script Throw Pillow and turn your house into a sophisticated, yet playful and inviting home. This accent pillow features a solid color faux linen that feels casual and welcoming. While the sequins script phrase "hello" adds a subtle hint of glamour to your space. Feather filled for luxurious comfort. Features a zipper closure. Measures 18x14"
Dimensions 18.0 In. X 3.0 In. X 14.0 In. Beautiful pillow! Love the sequins and the quality. Would highly recommend if you want to add a little glitz to your room. I like it so much I will be buying another one in a different color! Came on time in a plastic-wrap package. I personally appreciate this because it does not catch dusts during shipping! Although the texture of the fabric is a bit rough, the sequins are pretty and add "wow" factor to our living room. I like that it sends an inviting message too for folks coming into the area. This pillow looks good as an accent piece on my bed. But it’s only an accent piece not to lay on. I got the blue background and gray letters. They have a good variety of colors to match any decor. This is a fun pillow to greet guests. I used it at a bench near the front door. The color is more of a canvas/off white, and it's bigger than I had imagined (though accurate per the specs), but overall it's a nice pillow. My pillow is so cute. It's pink and goes perfect with my bedroom. It's also a nice size not small at all. i will be ordering another one. I recommend the purchase of this pillow. The wording is glitter. Beautiful pillow, however, it’s smaller and a different material than I expected. But I didn’t look at the measurements or description. It’s still perfect for its intended use and very shiny! Absolutely gorgeous pillow. Will be perfect for my home office. My first experience shopping with Overstock and when I received my pillow it was stained from the inside! I'm very disappointed with my first experience with Overstock. Just what I hoped it would be like! Very happy with the quality. Very nice quality and very cute!